Having Problems With Your Oven, Stove or Range? ​We would be happy to help! 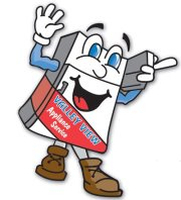 Valley View Appliances offers trustworthy service for your oven, stove or range repair and we strive to make your experience successful from start to finish. As a leader in the industry, Valley View Appliances will be able to provide you with top-notch service and we will get your oven, stove or range repaired smoothly and efficiently. 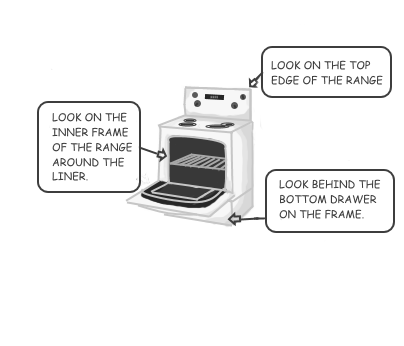 Referring to the image, locate and then record the model and serial number of your oven, stove or range. Keep it handy as we will need it when you book the service call. One self help tip would include ensuring the power is on by checking the electrical breaker. Simply switch the breaker that powers the oven, stove or range to the off position. Wait 10-15 min and switch back on. Due to the complexity and dangers of working with gas or electric ovens, stoves, or ranges, any repairs are best left to our certified appliance technicians. We would be happy to help you with your oven, stove or range repair service. Following the service call diagnosis (of 15 minutes or less), a quote for the repair cost will be given using the National Major Appliance Price Guide. This method guarantees you the lowest price possible as you are charged by the job and not by the hour! The quoted price includes a one-time charge for diagnosing the required repair as well as any necessary parts and labour. All of our trucks are fully stocked with parts for many common appliance repair issues but if we have to order a speciality part for your appliance repair, you will not be charged any additional fees for the return visit. Did you know that by applying the following tips, you can keep your oven, stove or range running more smoothly and efficiently. A clean oven, stove, or range will conduct heat more efficiently and extend the life of your bake or surface elements. Ensure that door gaskets are clean and flexible as this will provide a tight seal and prevent heat loss. 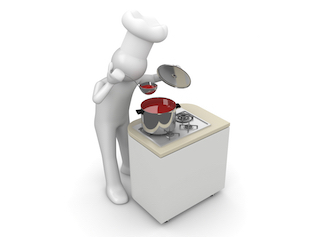 Ensure your induction cooktops have true induction pans that fit the burners properly to prevent error codes and issues. To order oven, stove, or range cleaners, or supplies call 1-866-243-4662.